With butter and cream cheese in the spinach filling, you can't go wrong with this rich spinach casserole. The ingredients are simple yet flavorful, and the casserole takes about 10 minutes to throw together. 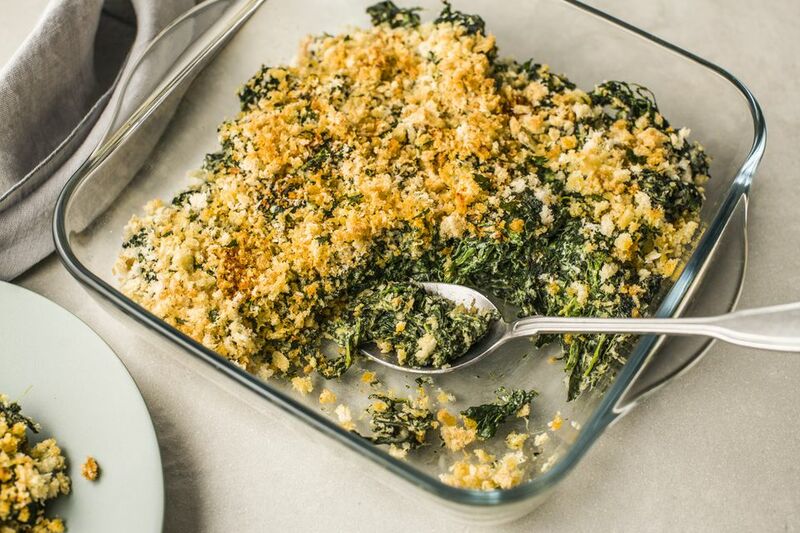 This casserole would be great made with frozen mixed greens, kale, or Swiss chard as well. A spinach casserole is an excellent choice for a steak dinner or roast. Or double the ingredients and take it along to a potluck; it will be a hit! The casserole is versatile as well, and other ingredients and flavors may be added, such as cheese, onion, and seasonings. See the variations for some additional ideas. Preheat the oven to 350 F. Grease a 1-quart to 1 1/2-quart casserole dish and set aside. Thaw the spinach in a colander under running water. Press or squeeze the thawed spinach to remove excess water. In a large mixing bowl, combine the spinach with the softened cream cheese and 1/4 cup of melted butter. Spoon into casserole dish and sprinkle with the bread crumbs and paprika. Drizzle with remaining 1/4 cup of butter. Bake the casserole in the preheated oven for 25 minutes. To avoid a watery casserole, make sure the spinach is well drained; use your hands to squeeze out as much excess moisture as possible. Frozen spinach is easy to use because it is already cooked and only has to be thawed and squeezed dry. Do you prefer fresh spinach? Plan on about 2 1/2 to 3 pounds if you prefer to use fresh. Wash the spinach and then chop it. Place a wide saucepan or skillet over medium-low heat. Add the spinach, a little at a time, adding more as the first additions wilt down. The spinach is done when it has all wilted. Cool the cooked spinach in a colander and squeeze out excess moisture. Add a few tablespoons of minced onions to the filling mixture, or sauté about 1/4 cup of chopped onions in butter and add them to the spinach mixture. Add a few gratings or a dash of ground nutmeg to the spinach filling. Instead of fine dry breadcrumbs, use fresh breadcrumbs seasoned with 1 teaspoon of Italian seasoning, 1 teaspoon of garlic powder, 1 teaspoon of onion powder, 1/2 teaspoon of salt, and 1/4 teaspoon of ground black pepper. Add a few tablespoons of grated Parmesan cheese to the spinach filling mixture along with the cream cheese. Replace the cream cheese with a 5-ounce package of Boursin cheese. Boursin cheese comes in several flavors, including garlic and herb, black pepper, basil and chive, and others. This stovetop version of spinach with Boursin cheese is another option. Reduce the cream cheese by half and add about 1/2 cup of cheddar cheese to the filling.